I'll tell you my experience Karang Bolong vacation at the beach in the area of ​​Anyer, sights traveled Karang Bolong into place when I was at my grandmother's house in Central Java. 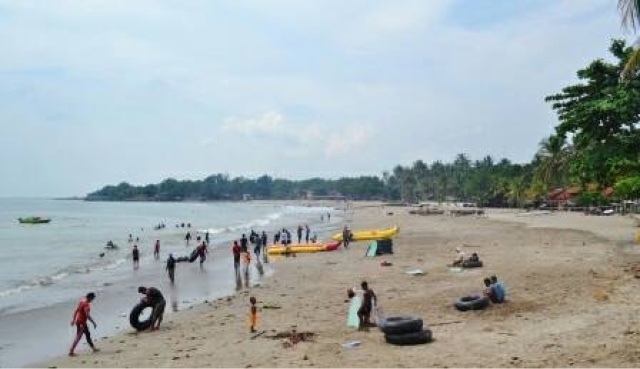 Here there is a fairly extensive coastal areas and ramps, unlike other beach locations in the area of ​​Anyer. Many tourists love to play sand beach and swim in Karang Bolong (including me), because there are some beaches that are not rocky so I can play more freely. It is located on the right path if you walk along Jalan Raya Anyer toward Caritadari Jakarta. Is one of the resorts are cheap and unique. For the cost of the car park was across the street entrance. The parking fee is Rp 5.000, - for each car. While the admission price for each visitor only Rp 5.000, - per person. Furthermore, the unique views regaled me, which is a large rock cliff or large rock bottom forming hollow as the entrance gate to the beach. 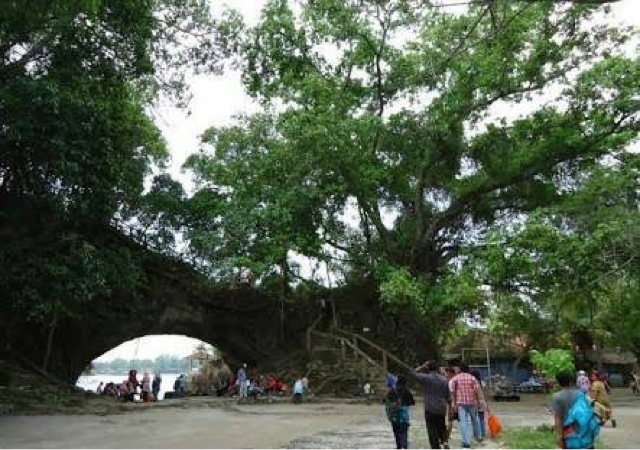 That is why it is called Karang Bolong beach because coral cavities (holes). Many visitors took time to take pictures in the hole selfie in this reef because of the background scenery is beautiful. With a background of beach and there is also a reef near the beach makes it seems a pity if it does not take pictures here. On the left side of this rock hole large tree roots to emerge on the surface. A unique landscape that also deserves to be immortalized in a photograph. I tried different things this time, I enjoy the beach Karang Bolong way up the stairs to the top of the reef which is perforated. The manager provided a ladder to get to the top. The streets are a little narrow, winding and uphill will be a little relieved by leafy trees at the top of this rock. In the middle of the trip there is the stem of the plant is large enough to hang over I made as if she were in a tree house. 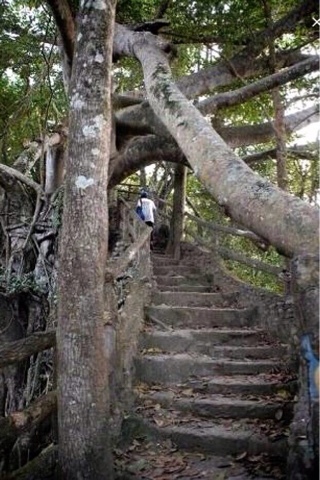 Nearing the end of the trip, I had to descend the stairs. Here there are ample places to enjoy the view from the beach over the reef. Looked at the left which saw many corals along the coast looked to the left or right side of which is less coral beach with so many other people who love to play on this beach. I can see Mount Anak Krakatau in the distance as he heard the sound of the waves that hit this reef.